Astor Metropole Hotel - The Astor Metropole Hotel Brisbane is a charming and tastefully decorated hotel that overlooks the Brisbane City and suburbs. This prime elevated location places just a short walk from the Brisbane City Centre and entertainment precincts, as well as being situated opposite the Central Station. Attractions Nearby: The Astor Metropole Hotel is close to everything with South Bank, Treasury Casino, Queen Street Mall, Qld Museum, Roma Street Bus Transit Centre, Central Station and Roma Street Parklands all within walking distance. Metropolitan Motor Inn - The Metropolitan Motor Inn Brisbane is a refreshingly different motel that provides excellence in service and value for money accommodation in Spring Hill business district. With great hospitality and wonderful guest facilities guests of the Metropolitan Motor Inn return time after time for the same level of service and great value. Attractions Nearby: Guests can take a short stroll to the CBD, Queen Street Mall, Treasury Casino, Convention Centre, Performing Arts Centre, Queensland Museum, South Bank Parklands and craft markets every Sunday at Eagle Street Pier. Diamant Hotel Brisbane - The Diamant Hotel Brisbane is a modern alternative to traditional hotel chains providing affordable accommodation without compromising on style or service. With a variety of comfortable rooms complete with stylish furnishings the Diamant Hotel allow you to customise your stay and also take advantage of the array of excellent facilities and services. Attractions Nearby: Situated nearby is a vast array of things to do and see, whether you are an adventure traveller, sightseer, art, music or food lover. NEXT Hotel Brisbane - The NEXT Hotel Brisbane is the perfect place to stay either to discover Brisbane on a short break or to base yourself for a business trip. With a wide choice of air-conditioned guest accommodation rooms as well as a range of guests facilities including restaurant, bar, heated outdoor swimming pool, spa, room service and tour desk the NEXT Hotel Brisbane is ideal for the discerning leisure and corporate guest. Attractions Nearby: A short stroll away is the Queensland Performing Arts Complex, South Bank with its 16 hectares of recreational parklands on the Brisbane River, Queen Street Mall and all other Brisbane city amenities. Econo Lodge City Star Brisbane - The Econo Lodge City Star Brisbane offers contemporary-styled and comfortable ensuite rooms that are perfect for the business of holiday guest who is travelling to Brisbane on a budget. The refurbished hotel rooms come complete with a range of amenities to make you feel right at home and the swimming pool which is set in tropical surrounding is sure to help you relax after a long hard day. Attractions Nearby: Visit 'The Gabba' for AFL and cricket matches, Southbank, Brisbane Convention & Exhibition Centre, Parliament House, Botanic Gardens, Sciencentre, QLD State Library, QLD Art Gallery & Museum or the Queensland Cultural Centre. Metro Hotel Tower Mill Brisbane - The Metro Hotel Tower Mill Brisbane offers affordable hotel rooms in the centre of the city, ensuring that all os the sights and experiences of Brisbane are right at your fingertips. The hotel also offers conference facilities and a fully licensed restaurant and bar which serves sensational modern cusine. Attractions Nearby: Ideally located just a short stroll from the South Bank Parklands, Botanic Gardens, museums, galleries, heritage sights, Treasury Casino, Brisbane Convention and Exhibition Centre, city centre shopping, Performing Arts Centre and major sporting venues. Mantra on Queen Hotel - The Mantra on Queen Hotel Brisbane offers spacious and sophisticated accommodation in a prominent 30 storey tower boasting panoramic city or river views. The Mantra on Queen also gives its guests the full use of their superb hotel facilities which includes a gymnasium, sauna, spa, swimming pool and even security undercover car parking. Attractions Nearby: If you take a short 10 minute walk from the Mantra On Queen will get to the Brisbane CBD, international shopping in Queen Street Mall, Treasury Casino and Central Station to catch a train to Milton Station and Suncorp Stadium. City Edge Brisbane Hotel - The City Edge Brisbane Hotel offers friendly service with unbeatable value for money rates that makes it the ideal home away from home for both business and holiday travellers. The City Edge Brisbane Hotel has been uniquely designed to suit the budget conscious traveller and it ideally place you in the heart of everything Brisbane has to offer. Attractions Nearby: Ideally situated close to the Treasury Casino, Cultural Centre, Southbank, Roma Street Parklands and the Queen Street Mall for shopping in the many well-known chain stores as well as numerous boutiques. Windsor International Hotel - The Windsor International Hotel Brisbane offers all types of travellers a range of hotel rooms providing guests with a unique boutique style accommodation experience. The facilities at the Windsor Hotel Brisbane include an outdoor swimming pool, tour desk, free off street undercover car parking and the Va Bene restaurant, which is known as Brisbane's best and most authentic taste of Italy. 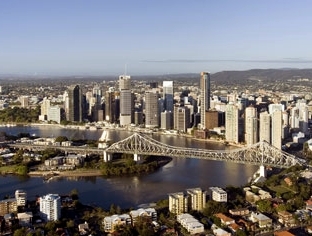 Attractions Nearby: The Windsor International Hotel is conveniently located just 3kms from the heart of Brisbane city centre and is close to the Royal Brisbane Hospital, Brisbane Exhibition Centre and numerous sporting venues. Snooze Inn Hotel - The Snooze Inn Hotel Brisbane offers clean, comfortable, value for money accommodation right in the heart of Brisbane's most happening and cosmopolitan suburb, Fortitude Valley. The Snooze Inn is situated near some of Brisbane's famous landmarks including, the RNA Exhibtion centre (EKKA) showgrounds, Chinatown, the Tivoli, Royal Brisbane Hospitial and Suncorp Stadium. Attractions Nearby: The Snooze Inn is located in Fortitude Valley close to some of the best clubs and bars in the city, concert venues, theatres and restaurants. Rendezvous Studio Hotel Brisbane on George - The Rendezvous Studio Hotel Brisbane on George provides a truly personal accommodation experience in the heart of the Brisbane city and a easy stroll to Southbank Entertainment precinct. The Rendezvous Studio Hotel has an extensive array of guest facilities including a restaurant serving modern Australian cuisine and a choice of three different room types, Deluxe, Executive and Spa suites. Attractions Nearby: The Rendezvous Studio Hotel Brisbane on George is located directly opposite Treasury Casino and close to the Queensland Performing Arts Complex, South Bank, City Botanic Gardens, City Heritage Walk and Brisbane River cruises. Rocklea International Hotel - The Rocklea International Hotel Brisbane is a modern boutique style accommodation that is conveniently located to all the southside industrial workplaces. The 'Market Place Restaurant' at this affordable Rocklea hotel serves delicious breakfast and dinner for guests, which is sure not to break their budget. Attractions Nearby: This property is located just a short drive to the Rocklea Market, Archerfield Airport and Speedway, Willowbank and Queensland Raceways, Southbank, the Gabba and ANZ Stadium. Brisbane Manor Hotel - The Brisbane Manor Hotel provides both corporate and leisure travelers with budget accommodation in a fantastic heritage building complete with a leafy veranda and fabulous sundeck bar. Offering some of the best budget accommodation in Brisbane the Brisbane Manor Hotel has the feeling of yester year, whilst still featuring all of the facilities that you need to have a great holiday experience. Attractions Nearby: ideally positioned in Fortitude Valley this hotel is just a short walk from all sorts of bars, cafes, clubs, shops and river city restaurants dotted along the banks of the Brisbane River. Diana Plaza Hotel - The Diana Plaza Hotel Brisbane is a boutique hotel conveniently positioned within walking distance to the Southbank Parklands and Gabba cricket ground. The excellent value for money hotel rooms at the Diana Plaza come complete with modern and comfortable furnishings and fittings, whilst the guest facilities at the hotel include a fully equipped gymnasium, spa, sauna, Asian Bath House, restaurant, cocktail bar and 24 hour reception. Attractions Nearby: Guests can take a leisurely 15 minute stroll to the famous Southbank Parklands where you can browse through the markets, which run from Friday night to Sunday, as well as go for a swim at Brisbane's only artificial beach. Sebel King George Square Brisbane - The Sebel King George Square Brisbane features newly refurbished Deluxe King Rooms each with fresh vibrant works of art and timelessly styled heritage features. Brisbane's original grand hotel has been recently refurbished and now not only provides excellent personalized service but also has a host of hotel facilities including a rooftop recreation deck featuring heated outdoor pool, sauna and fully equipped gymnasium. Attractions Nearby: The hotel is close to everything that the city has to offer, as well as having easy access to the financial district, major department stores and also being just a 10-15 minute walk from Suncorp Stadium.